The newly elected board of directors will lead the NEII mission as the organization continues to represent the global leaders in the building transportation industry through advocacy and code development. Tom Vining, President – Vining serves as president of Otis Americas, where he is responsible for the overall leadership and operating performance of Otis in North and South America. He has more than 25 years of industry experience. Sterrett Lloyd, Vice President – Lloyd currently holds the position of president at Draka Elevator Products where he directs the company's worldwide operations. He began his lifetime of industry service as a contractor and is the third generation of his family to work in the industry. Michael Bauschka, Treasurer – Bauschka is the controller and treasurer for KONE Americas, where he leads the general accounting, treasury and tax functions for the region. He has more than 20 years of experience in this role. Karen Penafiel, Secretary – Penafiel is the executive director of NEII and leads the staff team. She has over 28 years of building trade association management and advocacy experience. Larry Wash, KONE Inc.– Wash serves as KONE Inc.'s executive vice president and chief executive officer, a position he's held since 2012. Wash previously worked as president of Global Services for the Climate Solutions sector of Ingersoll Rand, vice president of service and contracting for Trane within North and Latin America, and in various leadership roles with Xerox and Eastman Kodak. Wash is the immediate past president of NEII. Katsuji Okuda, Fujitec America, Inc. – Okuda is responsible for managing all aspects of Fujitec America operations, including engineering, manufacturing, sales, marketing and service in more than 14 cities. He has more than 30 years of experience with Fujitec North America. Greg Ergenbright, Schindler Elevator Corporation – Ergenbright is CEO of Schindler Elevator Corporation's US operations. He has more than 20 years working in the elevator industry. Erik Zommers, Mitsubishi Electric US, Inc. – Zommers is senior vice president/general manager of Mitsubishi Electric US, Inc.'s elevator and escalator division. He has been with Mitsubishi Electric since 1989 and is in charge of all US operations for the division. Jon McCabe, Thyssenkrupp Elevator Company– McCabe is a LEED Green Associate and serves as executive vice president-field for Thyssenkrupp, a position he has held since 2011. The NEII Board of Directors sets the strategic direction of the association to drive its mission to advance safety and innovation in the building transportation industry throughout North America. “I am honored to be elected president of the NEII Board of Directors, which is comprised of recognized leaders in the building transportation industry," said Tom Vining, president of NEII. "The momentum built by the leadership team has led the organization to grow and evolve extensively over the past two years. I look forward to building on NEII's successes in the advocacy of safety, innovation and code development." NEII is the premier trade association representing the global leaders in the building transportation industry. 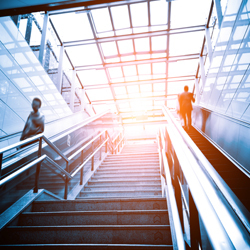 Its members install, maintain, and/or manufacture elevators, escalators, moving walks, and other building transportation products. NEII's membership includes the six major international companies - Fujitec America, Inc., KONE, Inc., Mitsubishi Electric US, Inc., Otis Elevator Company, Schindler Elevator Corporation, Thyssenkrupp Elevator Company and several other companies across the country. Collectively, the NEII members represent approximately eighty percent of the total hours worked within the elevator and escalator industry, employ more than 25,000 people in the U.S. and indirectly support hundreds of thousands of American jobs in affiliate industries. For more information about NEII, please visit www.neii.org.